© Population Action International, 2011. Contents of this and accompanying materials may be reproduced provided Population Action International is acknowledged as the source. Almost one in seven people around the world are chronically hungry, lacking enough food to be healthy and lead active lives. This is despite the fact that enough food exists for all of the world’s people.1 Agricultural policies, the prices of certain food commodities such as meat and grain and economic development hugely impact food security, but demographic trends also play a role. Increasing numbers of people often drive up demand for food, which typically results in additional use of arable land and water. This is especially true in the absence of adequate food production technology and integrated programs that simultaneously address community needs for food and reproductive health. 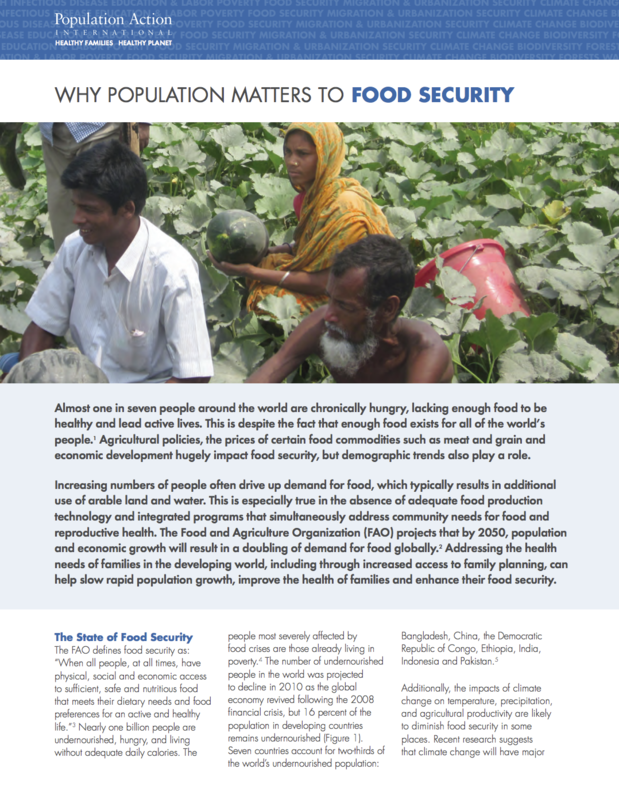 The Food and Agriculture Organization (FAO) projects that by 2050, population and economic growth will result in a doubling of demand for food globally.2 Addressing the health needs of families in the developing world, including through increased access to family planning, can help slow rapid population growth, improve the health of families and enhance their food security.